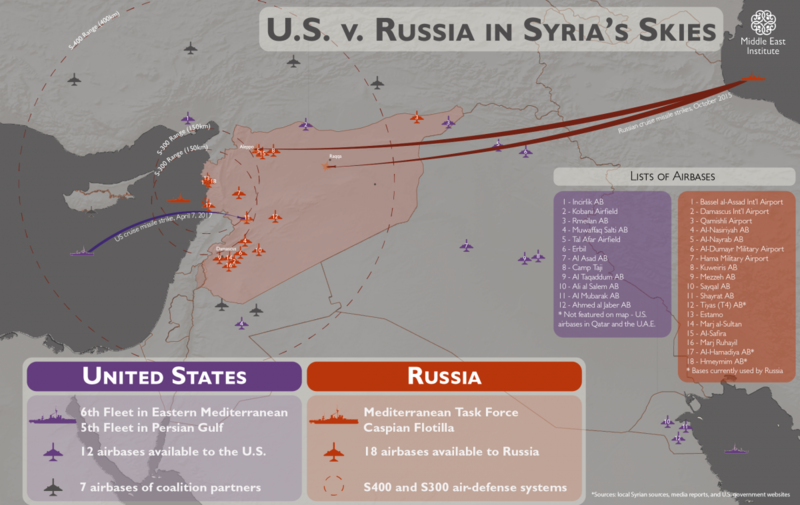 Since its military intervention in Syria in September 2015, Russia has sought to outmaneuver and heavily constrain U.S. access to Syrian airspace. Through a delicately managed process of de-confliction, Russia and the United States have avoided any hostile encounters over Syria's skies, but the relationship has been far from easy. Russian aircraft have repeatedly shadowed American jets on counter-ISIS missions, and on several occasions, they have attacked U.S. counter-ISIS partner forces on the ground in Syria. Despite attempts to stave off such incidents using agreed upon communications channels and procedures, Russia's assertion of its advantage over Syria has been clear. The United States has an extensive network of air assets distributed across the Middle East, capable of projecting unrivalled military power. Washington has also established at least two airfields inside northern Syria, to complement the capacity of its special forces personnel to fight ISIS alongside local partners. However, Russia's methodical deployment of airpower and its establishment of layered air defenses covering Syria and much of its neighboring environment means Russia rules Syria's airspace. When the Trump administration chose to fire 59 Tomahawk cruise missiles at the Assad regime's al-Shayrat airbase on April 7 in retaliation for the use of chemical weapons on Khan Sheikhoun three days earlier, Moscow was pre-informed hours earlier to ensure the strikes were not met with counter-escalation by Russia. Much of the U.S. counter-ISIS air activity over Syria's skies is the result of prior warning with Russia, in its main airbase at Hmeymim. Despite its advantage, Russia has not sought to distribute its fixed wing and rotary air assets across Syria, instead choosing to concentrate force in Hmeymim, in the northwestern governorate of Latakia. Russian helicopters have periodically been used out of Tiyas (T4) and Al-Hamadiyah airports, but only as forward deployed assets. Nevertheless, Russia has a series of operational Syrian air facilities potentially at its disposal, should it choose to shift posture and use them. For now though, and especially following the U.S. cruise missile strike, it seems likely that Russia and the Assad regime will choose to concentrate their aircraft (particularly fixed wing) in a smaller set of airbases, as a form of protection. Unless the United States decides to launch a significant series of saturation strikes, Russia's deployment of ground-based SA-22, S-300 and S-400 air defense systems, as well as the ship-based S-300FM surface-to-air missile system, means Moscow will continue to have the inherent advantage in any competition for Syria's skies.